Prices to patronize and rent Wauseon’s community swimming pool will increase slightly this season. City Council on Monday approved 6-0 the city Finance Committee’s recommendation to raise the costs of family passes, day care services, and private pool parties. The committee nixed a suggestion to purchase expensive pool accessories for children. 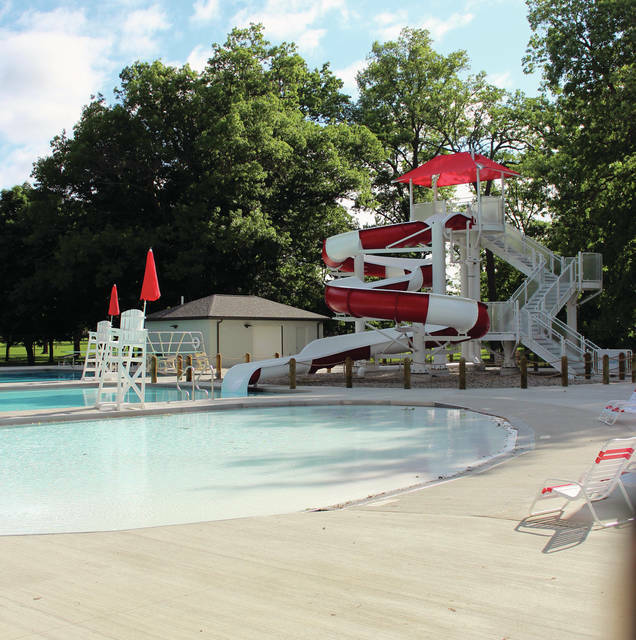 The increased prices, suggested by pool manager Tom Burkholder, include: family passes – inside city limits, from $125 to $140; outside city limits, from $175 to $190; and day care – from $200 to $225. Rental fees for 90-minute private pool parties without using the speed slide will be $125 for residents inside city limits and $175 for those outside city limits. The same rentals but using the slide will be $175 for residents inside city limits, $225 for those outside city limits. The $3 daily admission fee, $60 and $75 individual season passes, and $25 swimming lessons won’t change this year. The council also approved closing the pool on Saturdays at 5:30 p.m. to allow for an additional rental period from 6-7:30 p.m.
A discussion of purchasing children’s/toddlers’ pool accessories with elaborate water features was shot down at a March 8 Finance Committee meeting after Public Service Director Dennis Richardson shared a cost of between $15,000-$25,000 per accessory. Councilor Shane Chamberlin suggested Monday that they be budgeted for next year. Committee member Steve Schneider reported a $64,551 net loss for the pool in 2018. Richardson said at the committee meeting that a community swimming pool historically does not make a profit. Tree Commission spokesperson Rick Frey said plans are being made for Arbor Day programs at the city primary and middle schools on April 26. At the commission’s March 13 meeting, members were told that research has led to finding lower prices for engraved bricks for a proposed city memorial tree program. Artistic Memorials of Perrysburg will be contacted about cost. Member Pete Carr told the group tree limbs overhanging the Indian Hill Trail adjacent to Homecoming Park will be trimmed. He also said pick-up for the Soil and Water Conservation District tree sale will be April 5-6 at the Fulton County Fairgrounds. • Fire Chief Rick Sluder said the department is moving ahead with fire contracts with area townships. • Police Chief Keith Torbet reported that law enforcement officers countywide will attend a workshop about updated domestic violence laws March 28-29 at Rotary Park. He said the next Coffee With A Cop event will be held April 24, 8-9 a.m., at Sullys Bakery and Bistro, 206 N. Fulton St.
• Public Service Director Dennis Richardson told Council the Ohio Department of Transportation forwarded a list of requirements for a project to repave portions of Shoop Avenue and Elm Street. He said the regulations are specific due to some federal funding for the project. Richardson said he was asked at a March 7 meeting of the Northwestern Ohio Rails-To-Trails Association to request that Norfolk-Southern Railway install a crossing where the trail intersects with County Road 11. NORTA said grant programs could assist with the cost. City Council approved a final reading of a resolution authorizing Finance Director Jamie Giguere to increase or decrease some line item account appropriations within various funds of 2019. Council members also approved the second reading of a resolution authorizing Mayor Kathy Huner to enter a water service agreement with Fulton County. The city will supply surplus treated water through county water mains, not to exceed 100,000 gallons per day. In new business, Dan Nelson was appointed to the Tree Commission for a term through 2021. And the council did not object to approval of a D1 liquor license application for Wauseon Rollercade, 340 W. Leggett St. Earlier, Huner welcomed members of Oasis Christian Fellowship attending the meeting, and thanked the church congregation and employees of Triangular Processing for keeping city-planted flowers in the downtown area watered throughout last summer. Chamberlin called for an executive session to discuss city personnel. No action was taken.